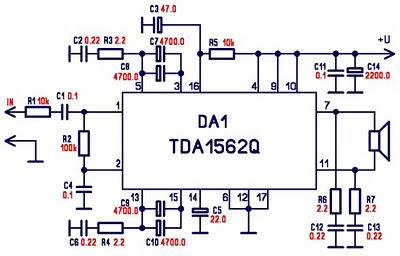 DA1562Q si a 70 W high efficiency power amplifier with diagnostic facility. The TDA1562Q contains a mono class-H BTL output power amplifier.At low output power, up to 18 W, the device operates as a normal BTL amplifier. When a larger output voltage swing is required, the internal supply voltage is lifted by means of the external electrolytic capacitors. Due to this momentarily higher supply voltage the obtainable output power is 70 W.
The heatsink should be designed for use with music signals. If the case temperature exceeds 120 °C, the device will switch back from class-H to class-B operation. The high power supply voltage is then disabled and the output power is limited to 20 W. When the supply voltage drops below the minimum operating level, the amplifier will be muted immediately.